First and foremost – I got my picture of my little follies (follicles!!) – they’re so cute and tiny!! I love them already, praying for them, and hoping they’re growing as they should!! Isn’t it great to see?? Can you already tell how adorable they are?? Lol. The photos are swapped. The picture on the left is of my right ovary, the left ovary is pictured on the right. 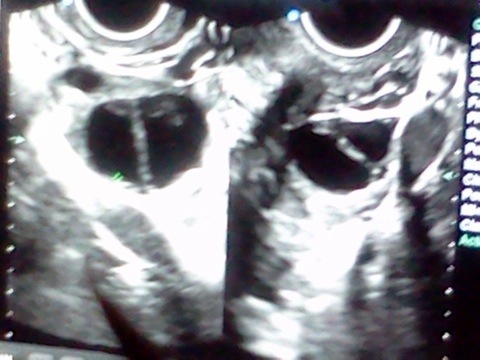 My little eggs are at the very top of my right ovary. I have some on the left, also. My right ovary tends to produce more eggs than the left, which is obvious on the picture. I had my appt on Tuesday, at that time I had an 18, 19, 17, two 15’s, and three 14’s. A mature follicle is 21mm so we have some good eggs!! We have A LOT of great eggs! I’d been on a double dose of Clomid so I was hoping for about 10. 8 isn’t bad and per our nurse – excellent. Almost too good. We have a great chance of conceiving multiples. So great that that we had a conversation with our nurse about selective reduction in the event we conceived four or more babies. Here’s the skinny on selective reduction in a nutshell ……. It’s aborting one or more embryo (a fertilized egg with a heartbeat) for the sake of their siblings’ and mother’s health. Choosing to “inject the embryo with a serum to stop the heartbeat”. As hard as our nurse tried, there’s no way to say that nicely, without gripping your heart. Without already grieving and pleading for your the lives of your babies who have yet to be conceived. Can you imagine, once you see and hear those beating hearts, how even more difficult the choice to reduce would be? My first question was: How do you choose? That answer is (medically & scientifically) quite simple. The embryo/s closest to the bottom of the uterus (nearest the birth canal) would be selected because of the simple fact that they’re more likely to miscarry. The scary part is that in trying to sacrifice one for the sake of the others- you may end up losing them all. Aborting babies we’ve prayed for and that God has blessed us with…… He creates life. Life that we wanted. That we’ve prayed for. And we choose to end a life? Or do we trust the same God that allowed us to conceive to sustain life – for His glory. Seems odd that we would trust Him for one thing but not another. Then, there is the other side of the coin….. Carrying 4+ babies would be rough. For me and them. Can you imagine how cramped and crowded they’d be? How uncomfortable I’d be? Lol. Makes me laugh already. Fewer babies means fewer complications. And, a mommy who would be able to get around. Lol. However, that’s a conversation and decision we may not even have to concern ourselves with. That we’re NOT concerning ourselves with. I’m glad the nurse informed us of possibilities and what we could be up against but we’re not focusing on that. Regardless of what happens – we choose to trust God. He never makes mistakes. Ever. So if He chooses to bless us with four Baby Mayes’ – we’ll have four babies to raise to love and trust in God. Period. That’s my stance. I trust God for our babies’ health. I entrust their lives & viability to THEIR Father. To our Father. The One who created them. It’s not my actions or decisions that bring them into existence, it’s not my right to decide to send them back to Him. IUI #2 scheduled for tomorrow 10:30a. We’re ready!! Pray with us, pray for us. This is an awesome report!! I will continue to pray for your family. It would be hilarious and cute to see you carrying 4 babies. You will definitely need a nanny to help with 4 babies……………and an extra pair of boobies to feed them. You are hilarious!!!! That means stay at home!!! Woot- woooooot!!! And invest in a great pump! Lol. That’s wonderful news!! I just had my baseline ultrasound and we’re gearing up to go into our 3rd IUI cycle. Sprinkling baby dust your way! Good luck!!!! That’s exciting!!! It’ll be great! I’m praying for you guys tooo!!!! I agree with your position on trusting God whether it be with one or 6 embryos. Life is His to give. We are but vessels.